SSL, a business unit of Maxar Technologies (formerly MacDonald, Dettwiler and Associates Ltd.) (NYSE: MAXR; TSX: MAXR), announced that the LEO communications satellite the company recently provided to Telesat has arrived at the Vostochny Cosmodrome in Eastern Russia where it will launch aboard a Soyuz-2 vehicle provided by Glavkosmos. This will be one of two Telesat Phase 1 satellites planned for launch this year that will allow Telesat to start testing key performance parameters of their next generation global LEO constellation. SSL’s growing LEO business includes satellites for Earth Observation, communications and satellite servicing and demonstrates the company’s agility in implementing new technologies and processes to drive innovation. 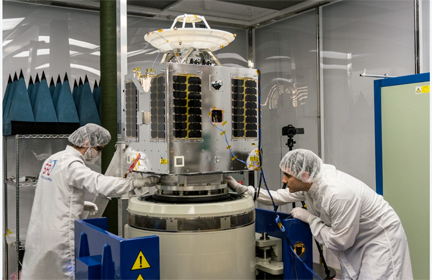 Dario Zamarian, the group president of SSL, stated that developing this innovative LEO spacecraft for Telesat demonstrates SSL's strength in collaborating with partners to meet new space goals. With this satellite for Telesat, the company has taken an entirely fresh approach to designing a high performing smallsat that will advance Telesat’s plans to launch an important next-generation business. Dave Wendling, Chief Technical Officer of Telesat, added that Telesat’s LEO constellation will deliver fiber-like broadband on a global basis to commercial and government markets, and the launch of our Phase 1 LEO satellites is the starting point in making this next generation system a reality. The company looks forward to a successful launch and the start of testing on our Phase 1 LEO satellites shortly thereafter.